MARIETTA – On Wednesday evening, a large group of union members, leaders and activists held a rally at the Plumbers (UA) Local 168 Hall in Marietta to kick-off the Labor 2018 election effort to elect worker-friendly candidates in the 2018 elections. “We are organizing against economic rules that are increasingly rigged against working people,” said Ohio AFL-CIO Tim Burga. “The 2018 campaign will be about taking back state government to achieve an economy that works for us all,” Burga said. 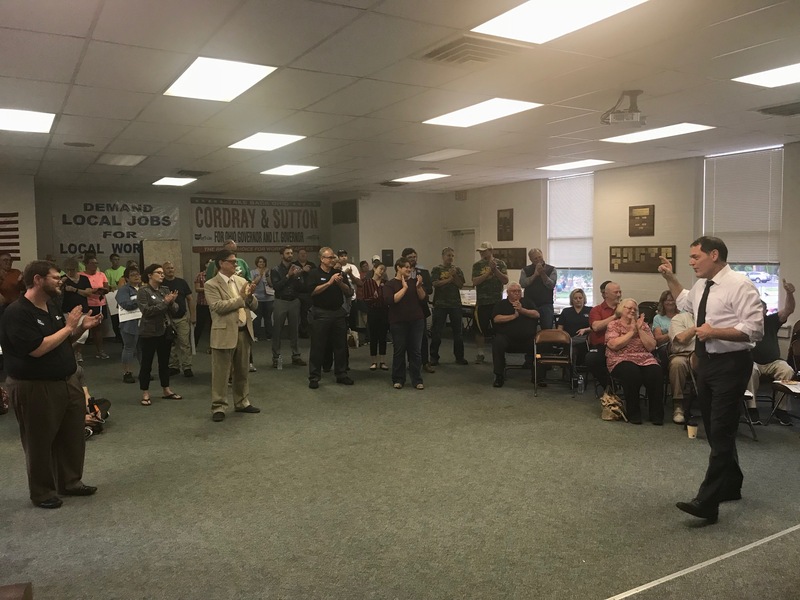 “Southeast Ohio needs leaders who will look out for the interests of working people and we will get that with Rich Cordray as Governor,” said Southeast Ohio AFL-CIO President Ted Linscott. “In electing our slate of candidates this fall, our membership can expect a government that is on our side, instead of having to look over our shoulders for the next attack. We need leaders that value the honor of work.,” Linscott said. “As Ohio’s next Attorney General, I will stand shoulder to shoulder with working men and women to make sure every Ohioan gets a fair shot,” said Steve Dettelbach, candidate for Ohio Attorney General. “People are tired of a political system where the powerful play by a different set of rules than everyone else — it is time to crack down on special interests and stand up for working people and their families,” Dettelbach said. “As the product of an Appalachian family with deep ties to the labor movement, I’ve seen the immense impact that collective bargaining rights have had on millions of families in our state,” said State Auditor candidate Zack Space. “I have always stood with the men and women of organized labor and am excited to use the considerable power of the Auditor of State’s office to ensure that working families have an ally in state government again,” Space said. The Marietta event was one of a series of six kick-off rallies across the state with other events happening this month in Lordstown, Cincinnati, Cleveland, Columbus and Toledo.